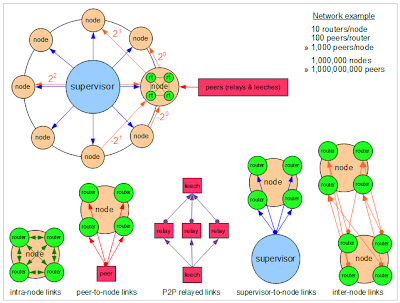 P2P OS: Distributed server: any DHT will do, right? Wrong. Distributed server: any DHT will do, right? Wrong. 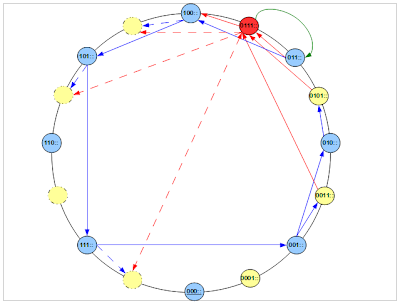 After diving into DHTs a while ago, i first thought i had it all figured out: DHT is the name of the game when it comes to distributed servers, or, at the very least, they are an appropriate and mature solution for providing a distributed routing service. And apparently that is indeed the case, but with a caveat: all the common DHT algorithms presented in the literature are highly unreliable in a high-churn rate [residential] end-user-supported P2P network. More specifically, what all common DHT algorithms (that i know of) lack is on one hand enough redundancy to cope with the kind of churn typically found in end-user P2P networks (where users frequently join and leave he network, unlike in a network of long-lived servers), and on the other hand they are not sufficiently resilient to face the kinds of concerted attacks that can be perpetrated in a P2P network by a set of coordinated malicious nodes. To make the long story short, the conclusion for all this was that building the P2P OS distributed server by simply copy-pasting an existing DHT algorithm is a no-go, and this sent me right back to square one: "now what?" Sure enough, the points listed above are just the very top-level adjustments that i'm trying to make to the existing plain-vanilla DHTs, but there are quite a lot of fine points that need to be actually implemented and tested before celebrating, e.g. the iterative routing algorithm with progress monitor at each step in the routing process, having multiple paths from one node to another supported by a backtracking algorithm, node state monitoring and maintenance by the supervisor server, etc - and these are just a few examples of the issues that i am aware of. So basically this is how far i got: i have this "supervised network" architecture which i think might be a solution for a sufficiently resilient and reliable distributed server, and i have the code obfuscation-based network integrity protection, but now i need to test these thingies the best i can. I definitely won't be able to test a large-scale system anywhere near a real-life scenario until actually deploying it in the wild, but a preliminary validation of its key features taken one by one seems feasible.